1. The state cannot be used to serve the interests of any political party. Instead, it has to be operated in such an unbiased and fair manner which ensures the freedom and welfare of all its citizens. We believe that all Hungarian people must have an equal share of rights and responsibilities, regardless of their origin, ethnicity, gender or religion. 2. We demand freedom for the press! It is the duty of the state to make sure that its citizens are provided with unbiased and balanced information. The taxpayer-funded public media must not be used as a mouthpiece of pro-government propaganda. We want independent journalism instead of hired scribblers! 3. We are fighting together against poverty and vulnerability to achieve a wider social solidarity. No moral society can abandon its members in need; the families, the elderly or the ill. The state must not incite against its own citizens. The right for human dignity must be equally guaranteed for all members of the society. 4. Hungary historically belongs to the community of European nations. We stand united to resist any agenda which, contrary to our national interests, would lead Hungary out of the European Union and make it a part of Russia’s sphere of influence. We will defend our homeland! 5. We consider our national cohesion as a value and we support preserving the identity of Hungarian communities, no matter where they may live in the world. We will not allow Hungary’s poisoned public discourse and the constant financial insecurity drive away our compatriots who seek prosperity. 6. Each member of the society is entitled to high-quality education as well as health and social care. We stand for the rights of employees and unions, the right to freedom of expression in the workplace, the restoration of the right for strike action, decent wages and fair labour conditions. We will use any available means to annul the slavery law. 7. We demand legal certainty and equality before the law. Any discrimination based on political and financial status must be eliminated. We stand against corruption, the theft and dissipation of public assets. 8. 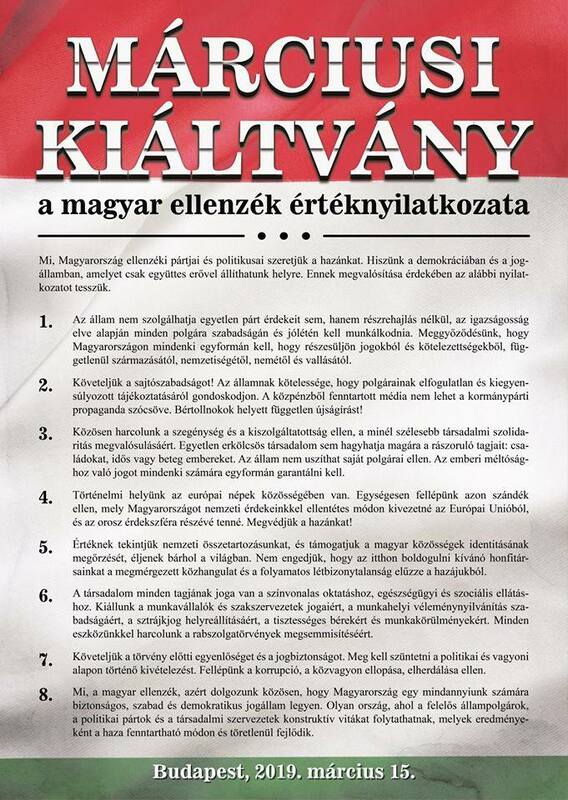 We, the Hungarian opposition, are united to work for Hungary to become a safe, free and democratic country where the rule of law applies to all of us. We strive for a Hungary where responsible citizens, political parties and NGOs are able to conduct constructive debates, thus ensuring the seamless and sustainable development of our homeland.